As many of you know, the Student Refugee Program at UBC (managed through WUSC), sponsors approximately 2-3 refugee students to come study at UBC each year. Each refugee is sponsored by a WUSC group on campus that raises the necessary funds to support the student for one year and negotiates with their college or university to waive tuition, residence fees or donate other items. The onlyprogram of its kind in Canada, the SRP enables individual refugees to pursue their education and a better life in an environment free of violence or fear. At the same time it offers students and faculty onCanadian campuses a unique opportunity to learn first-hand about refugee and development issues. 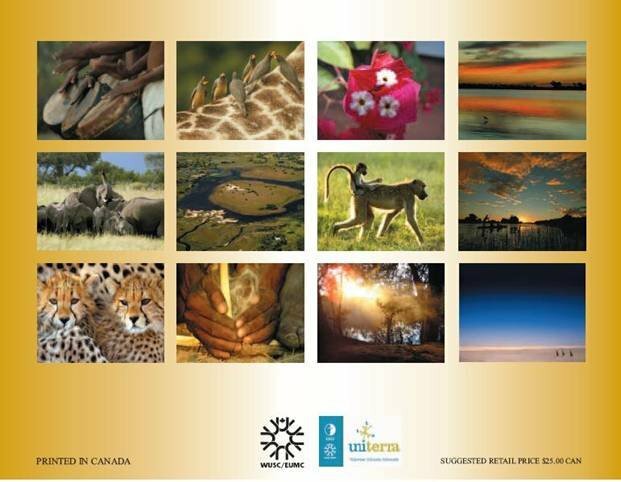 Unfortunately, because of loss of funding, this year UBC students need to raise $7500.00"
Calendars are $15 (tax and everything included), and the attached photos do not do it justice! Please HELP us meet our goal, and enjoy a beautiful token of an amazing African country in the process!